So.. lets start. And lets look at the problem. At the moment, what you can see on the graph below on screenshot, apex prices are +- stable at this point of time, BUT. They've been rapidly getting higher in price and getting lower on total sales a day. Daily sales are important and they show how many apexes people actually buy, but if you think about it, if you see that amount of apexes that got bought this week and 3 weeks before are kinda the same, but price is higher, you can say with full confidence that the amount of apexes we have on the market is not enough to cover the demand of those. But why? This is the reason why we have the problem in place: yes, those credit packs that are basically the sale of credits with huge discounts that makes buying apexes not worth it. Right? Yes. And someone might say "just add same discount for apexes" or "just remove those discounts from freaking credit packs", sounds about right, but not gonna work here. Because we also (sadly) need to take under consideration the fact that Trion (and XL ofc) need to compete with goldsellers as well. I dont promote it in any way, just mentioning since everyone knows its a thing, no need to censor that (i hope); So they need to offer us, the players, something that will be worth buying to get in game gold to save our time. So, to the solution. With all that I said above in mind, I think, that RU-region got the BEST solution to keep APEX price separate from credits sales AND at the same time not to be driven by greedy players who trying to re-sell valuable item (in f2p players eyes) while its not valuable item in p2w players eyes. They sell APEX directly IN GAME MARKETPLACE for value that is SLIGHTLY HIGHER than what those APEXes gives. As an example, their APEX price (remember, its a RU region, people over there have different pay checks, way less than any EU country over there, they cant afford our patron price and thinking that its overpriced) is 2,64 dollars or 2,27 euro respectively. They also need 2 apexes to get patron. 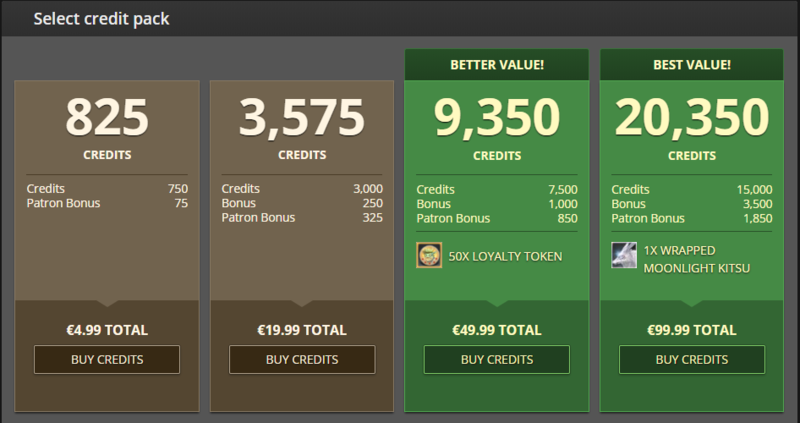 Each APEX gives them 150 credits (1 credit there = 1 rub aka russian currency) and for patron you need 300 credits. While APEX on Marketplace costs 180 credits (prices in euro/dollars are mentioned above) that is equivalent to 180 russian rubles. So, what that solves? They still can run credit sales, and they do that often. They sell on site ONLY credits and some packs as we do, but APEXes stay for ingame purchase, like the item you can buy to sell your credits with profits. Because item is still valuable, so the price of it goes even DOWN because its the fastest way of exchanging credits to gold in game because of how demanding it is. BUT! This is not the only solution i think should be in place here. Another thing was mentioned before by someone else somewhere on this forums deeps: make APEX work same as auction mannequin. How is that? Lets say you bought an apex for ingame credits from ingame marketplace. Then you can decide - sell it, or use on one of your alts or anything else that might come to your mind. So once you sent it over ingame mail it becomes bound for the character who got it. And same for Auction House, if someone bought an APEX it becomes bound. So that will solve two problems: 1st, reselling is not possible, so price does not go up because of resellers making it high cuz of high demand. And if we got the apex in marketplace for credits we dont have problem where people doesnt count APEX as valuable item to buy for reselling for gold, so they just buy credits instead and here we go again - apex price getting higher. I would say any practical solution has to rely entirely or almost entirely on systems that are outside of the game itself -- systems over which Trion has direct control. So, no having NPCs buy or sell APEX. Nothing that requires XL to code a new function for something inside the game; that is normally a very slow process. Additionally, it seems to me that it's necessary to define what the intent of selling APEX really is before you can make any rational changes to the method of purchase. It's very rare for me to buy APEX with cash, and I don't think I've ever bought it with gold except as a gift for someone else, so this is about all I can offer for thoughts. The reason APEX are so high has nothing to do with what you posted. The reason they're so inflated is because there is very little for players to actually buy in game so they just put all their gold into APEX because APEX will always be naturally on par with the value of gold. Since they removed obsidian, introduced Hiram, removed much of the regrade RNG, introduced crystallization...there's just not much gold dumps in the game anymore. This is why you notice at the beginning of FS patches when they introduced new tiers of gear, APEX prices dip a little bit because there's actually a reason for people to sell their APEX for gold. This is spot on, and credit packs where always discounted, if you exclude 50 loyalty an dthat silly mount, the amounts of credits you get is always the same. The APEX problem is not with credits. The APEX problem is supply, people have quit the game no one is buying (not as much as used to anyway). Unless population comes back and many core problems in the game are resolved, nothing will change. And now why anyone would spend on APEX?? Most people that where/are spending money, are in position of making decision not to do so anymore due to economy being totally destroyed, players leaving the game, and no fundamental changes to content of the game. So no supply = high APEX price get used to it for a while or possibly forever now on till game dies.